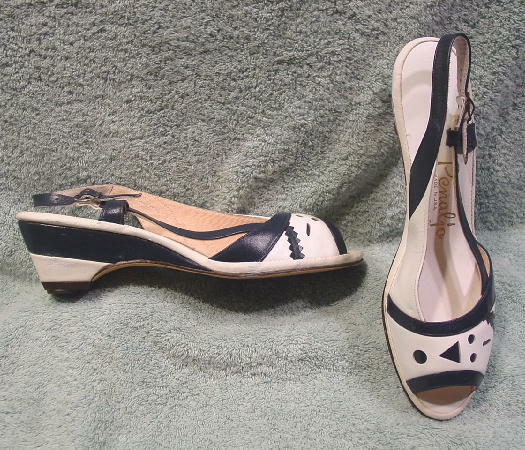 These vintage blue and white sandals were made in the USA by Penaljo. They have manmade soles and the heels have little rubber heel guards. They have sling backs and white insoles. Across the front are five cutout areas with sunken blue leather inserts. There are some blue dye stains on the outer sides of the footbed. The right shoe inner and backside of the white leather heel have line scratches. The left shoe has 2 areas on the inner back side where the blue finish is missing.